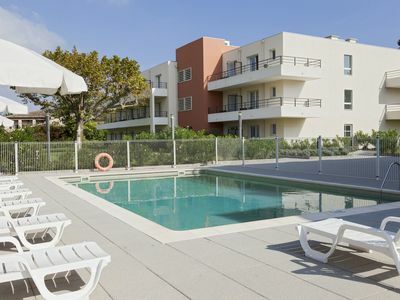 Mandelieu 7 km from Cannes: Modern aparthotel "Comfort suite Mandelieu", 3 storeys. 70 apartments in the residence. Outside the resort, 7 km from the centre of Cannes, in a quiet position in the residential district, 700 m from the sea, 700 m from the beach. For shared use: park (fenced) with lawn and trees, swimming pool fenced (10 x 8 m, 01.04.-01.09.). In the complex: reception, breakfast room, WiFi. Shop, restaurant 800 m, sandy beach "700". Golf course (18 hole) 3 km. Nearby attractions: Palais des Festivals 7 km, Centre des Expositions 2 km, Grasse 24 km, Antibes 22 km, Nice 40 km. Hot and cold buffet: 8 euros/adult (13+), 6 euros/child (3 years to 12 years), free for children under 3 years. 1-room studio 20 m2. Beautiful and modern furnishings: living/dining room with 2 sleeping facilities, TV and international TV channels (flat screen), air conditioning. Kitchenette (dishwasher, 2 ceramic glass hob hotplates). Shower/WC. Terrace. Terrace furniture.